I came across an article that suggests researchers may have discovered a drug that will effectively "vaccinate" certain women from the threat of breast cancer. To women with a faulty BRCA1 or 2 gene (the latter discovered almost 12 years ago), this will be very good news, especially as the drug appears to be free of the side-effects associated with other cancer treatments, including pain, nausea and hair loss. In the ruins of New York city, in the year 2012, Robert Neville is the lone survivor of a biochemical disease which, back in 2009, was supposed to cure cancer. Surrounded by blood thirsty zombies, with only his trusty dog Samantha for company, Robert tries to discover a cure for this disease. I recently came across the TV show Quarterlife, which NBC have just started airing in America. I'd originally been watching low quality copies on YouTube (uploaded by quarterlife), but I discovered that the main website has high quality versions, versions that play in widescreen (rather than YouTube's stupid letterbox), versions that you can happily watch without thinking "I'm streaming something over the internet". Is this the future of TV? Pick an episode to watch in your own time, watch it immediately without any stuttering, in high quality. It's free, it's legal, it's an opportunity for people to create new TV shows and let the world decide if they like it. And perhaps small shows, just like Quarterlife, will get picked up by someone bigger and the rest of the world get to enjoy something special. Much like Radiohead's recent approach to selling music (and the subsequent copycats), it sometimes takes a big risk to change the way things are done, to shake up the traditional business model that has made fortunes for networks in the past, but thanks to things like Felicia Day's "The Guild" (which I still haven't watched yet) and shows like "Quarterlife" (and all the ventures before them, such as Lonelygirl15, which I also haven't watched), perhaps this generation can bypass the big networks that cancel popular shows at a whim (seriously, 1-4 episodes and you cancel it, and then wonder why no one ever bothers watching your new shows?). Perhaps by embracing - rather than fighting - the internet, everyone will gain. The downside? Bandwidth costs money, going it alone will be expensive, and at some point the Web 2.0 ventures will begin to fail (like the dot com revolution before it) and sites will shut down (did I read that DivX Studios has just closed down?) and all we'll be left with is crappy letterboxed YouTube thanks to the billions of dollars that Google can sink into it. You think Microsoft have a monopoly? Think again. Or perhaps the community will start to fund their own site that hosts such content. I don't mean some kind of Youtube clone, with user generated content that either lasts 2 minutes or is a broken up version of a copyrighted TV show; I mean a site where users upload high quality episodes that are at least 20 minutes long, and suitable to get picked up and broadcasted by traditional television networks. The show initially launched on MyspaceTV.com and quarterlife.com in November 2007 (a decade after one of my past websites was officially launched). The series includes 36 eight minute webisodes, with two new episodes airing each week. The show is also available on other sites such as YouTube, Facebook, and Imeem, as well as NBC.com. Quarterlife tells the ongoing stories of six creative people in their twenties. The cast are great, many of them are recognisable from shows such as Lost, Medium, Greek and Entourage. Enjoy: Quarterlife. I tried to install it from my hard disk (as I can't mount ISOs on Vista) but I was told "The language of this installation package is not supported by your system". It turns out that this message is displayed when the ISO image hasn't been extracted properly using ISO Buster (or other similar tools). To fix it, select the normal extract indicated by the ">>>" button, do not extract the files as an ISO. And then it all installed okay. Microsoft recently tried to clarify the situation by stating that there were problems with drivers not working after the update was installed. Mike Nash from Microsoft's Windows product management group said there were no problems when Vista SP1 was shipped pre-installed, but it seems that SP1 messes up the drivers during the SP1 update process. The advice is currently to uninstall and re-install the drivers (not difficult for me, but not so trivial for non-technical users). I think I know what they mean by driver problems, as I've been running SP1 RC for a while (the first version, not the refresh they did fairly recently IIRC), and one of the quirks I've noticed is that my screen doesn't always redraw properly. This was most noticeable when I locked the computer, as the screen would go black, and if I moved the cursor or type something you could see the text box for the passwor, but the pretty background was absent. Also, sometimes IE wouldn't redraw the web page properly, resulting in a "see through" browser in places. I uninstalled my graphics card on the system running the SP1 RC (Intel 965 integrated graphics) and hoped it'd reintallt the right driver. It failed to find a suitable driver, so I ended up downloading the very latest one from the Intel website instead, and everything appears to be running fine now. Well, possibly aside from one bug. My laptop has crashed a couple of times trying to resume from hibernate, according to Microsoft there's a hotfix that solves the problem (which I think appears to be using hibernate with a wireless network card), but when I tried to install the update it told me that the update didn't apply (I'm not sure if that means it's already part of SP1 or just that the build number didn't match or something?). But it hasn't happened since I reinstalled the graphics card driver, so it's possible that I won't see this error again. Time will tell. And hopefully in a couple weeks time I'll finally be able to grab SP1 via Technet. I could probably obtain SP1 from elsewhere, but I prefer to grab my Windows binary files from reputable sources (e.g. Microsoft's Download Center, Technet Subscriber Downloads). I caught a documentary last night, "Saved By Dolphins", part of the Natural World series on BBC2. It was all about a school of dolphins (they reckon the first couple may have attracted others from up to 7km away to help out!) that protected a group of humans from a great white shark in New Zealand, and it made me feel a lot more positive. If only all humans were that smart and altruistic. And it's repeated on BBC One (London only) at 02:20 on February 14th. I finally caught up with the spinoff from "Life On Mars" and I'm still not sure what to make of it. Sure, Keeley Hawes does look quite hot (despite the '80s hair), but something about the series doesn't feel quite right. Perhaps it'll grow on me. Oh, and I'm pretty sure my dad has a tie that looks very similar (identical?) to Gene Hunt's! I decided to bite the bullet and pay for CoreAVC Professional. It's less than £8, and I'm hoping (because it's the professional version) that the SMP support will allow me to play 1080p H.264 files without any trouble on my 1.86GHz Core 2 Duo system. If it does work, I won't have to worry too much about my next upgrade. I've been toying between a fast dual core CPU (E8500 3.16GHz for around £176) or paying slightly more for a slower quad core (Q9450 2.66GHz for around £211) that would provide more overall processing power - good for playing games or encoding things. But if my 1.86GHz can cope with 1080p using CoreAVC (it can't using ffdshow, as it's not multithreaded so it maxes out one core and drops frames), the quad core option definitely wouldn't be a problem - it'd probably even be fine with ffdshow, but I don't want to take a risk. Not when it costs less than £8 to come to a conclusion. I hope they add GPU support soon, as I expect my new 3870 will drop the CPU usage to something negligible. And once I've come to a conclusion, it'll probably just be a waiting game until the CPUs are in stock. I still have to decide on a new motherboard though. And maybe some more RAM, a pair of 2GB sticks are dirt cheap right now. Or is it? Why do I see it saying Service Pack 1? Presumably because it's based on the same code as Vista SP1, but Microsoft have never released an RTM product that presents itself as SP1. Until now. It's also surprisingly easy to make it look and act just like Vista (as you can probably tell from the screenshot, I've enabled Themes), except it also supports RAID5 (which Vista had been crippled not to support). On the down side, I can't get Windows Media Center to work on it (yet?). 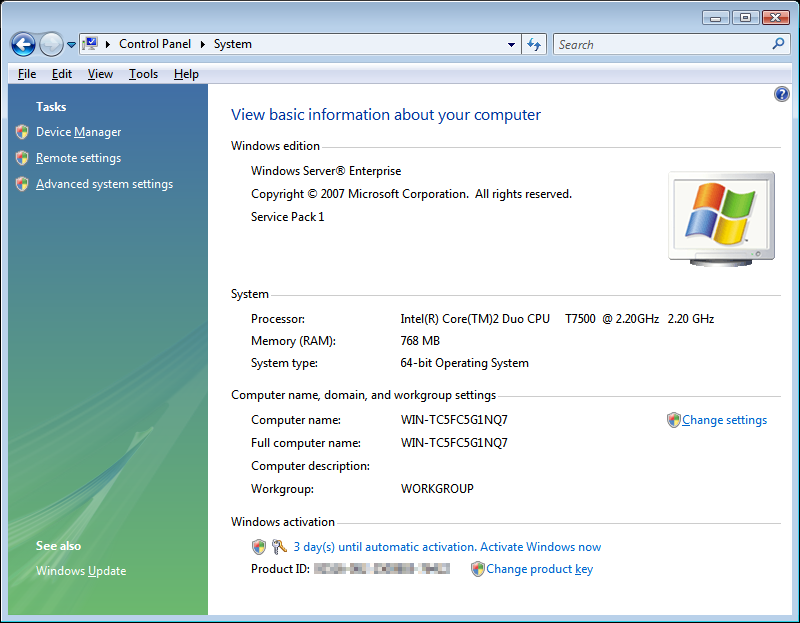 I was also quite impressed that Vista x86 running VMWare was able to use the CPU's virtualization technology so I could install and run Windows 2008 x64. I also came across this interesting comment on a forum post - presumably about RC1: "There actually is a fairly odd performance difference between Vista and 2K8 even as alike as they can be gotten. F.E.A.R. shows a difference of around 56 fps average on Vista vs 67 under 2K8, and a "max framerate" difference of 96 vs 112... it even defaults to lower settings than 2K8 does. I'm kind of shocked to find that I got that large a difference when I was expecting none at all."